EAST RUTHERFORD, N.J. – Neymar and Roberto Firmino scored first-half goals, and Brazil overwhelmed the United States 2-0 on Friday night in an exhibition before a sparse crowd at MetLife Stadium. Firmino scored in the 11th minute off a cross from Douglas Costa, who burst down a flank past 21-year-old left back Antonee Robinson. Neymar converted a penalty kick in the 44th for his 58th goal in 91 international appearances, third in Brazilian history behind Pele (77) and Ronaldo (62). The U.S. has two wins, two losses and three ties under interim coach Dave Sarachan, who took over last October after the Americans failed to qualify for the World Cup. New general manager Earnie Stewart said this week a permanent coach will be announced later this year. Just 32,469 attended the match at MetLife Stadium, a possible site of the 2026 World Cup final, and Brazilian supporters outnumbered Americans by about a 10-1 margin. When Brazil beat the U.S. 2-0 at Metlife Stadium in August 2010 shortly after the venue opened, the game drew 77,223. 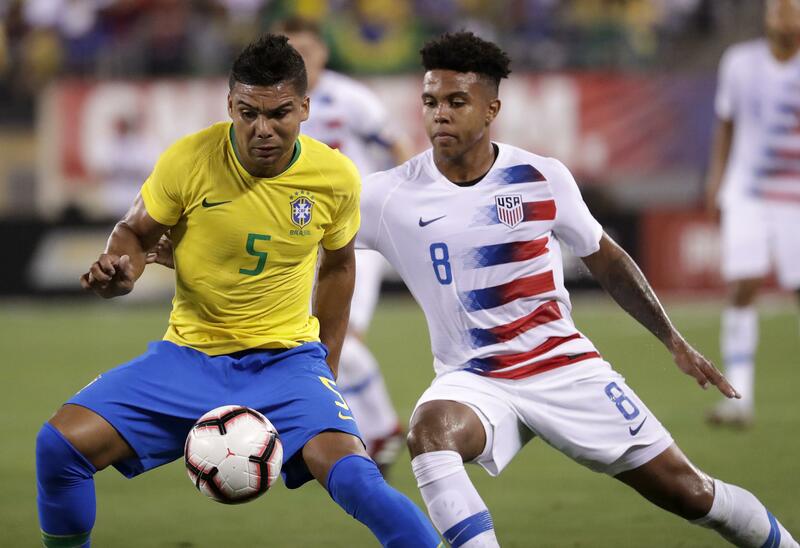 Brazil, in its first match since a quarterfinal loss to Belgium at the World Cup, improved to 18-1 against the U.S. and has won 11 straight since a 1-0 loss in the 1998 CONCACAF Gold Cup. The Selecao has outscored the Americans 41-12, including 17-2 since the U.S. took a 2-0 lead in the 2009 Confederations Cup final – a game Brazil won 3-2. The temporary grass field installed over the artificial turf had some brown patches. The section of American Outlaws behind one goal held up photos of Clint Dempsey before the match in honor of the U.S. star, who announced his retirement on Aug. 29. Brazil went ahead when Firmino split defenders Matt Miazga and John Brooks and with his right foot directed the ball past goalkeeper Zack Steffen for his eighth goal in 26 international appearances. The U.S. didn’t threaten until a sequence of three corner kicks just past the half-hour mark. Neymar converted a penalty kick after a debatable call by Mexican referee Fernando Guerrero, the fourth official for U.S. loss at Trinidad and Tobago last October that eliminated the Americans in World Cup. Fabinho played a 1-2 with Firmino and cut into the penalty area. Wil Trapp appeared to give him the slightest of pushes and Fabinho tumbled past Brooks. Neymar stutter-stepped in his run-up, Steffen dove to his right and the striker softly kicked the ball in the other way. Steffen kicked out his left foot in the 51st minute to save Neymar’s 6-yard shot off a pass from Costa, and Miazga cleared the ball off the line. Arthur, Lucas Paqueta and Richarlison made their Brazil debuts in the second half, and Dede made his first appearance in five years. The best U.S. chance was Weston McKennie’s left-footed shot off a Kellyn Acosta pass in the 66th, which went wide. Notes: Sarachan will run the team for Tuesday’s friendly against Mexico in Nashville, Tennessee, and possibly for exhibitions on Oct. 12 against Colombia at Tampa, Florida, and versus Peru four days later at East Hartford, Connecticut. The U.S. also plays England and Italy in November. Published: Sept. 7, 2018, 7:32 p.m.